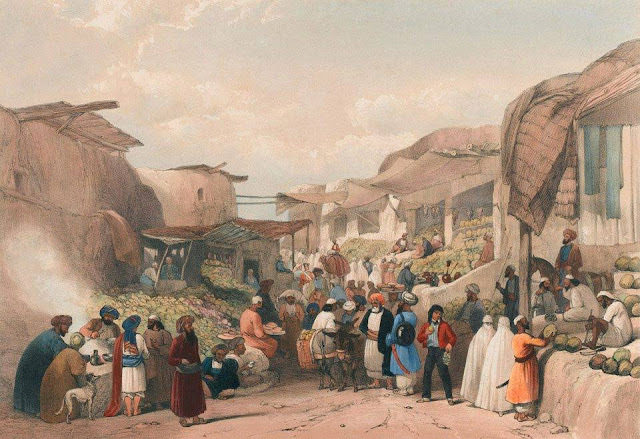 The Main Street in the Bazaar at Kabul in the Fruit Season', c.1840 . By James Atkinson. "I paid my first visit to the city this afternoon. The path was crowded with people, and after a pretty long ride we entered, not by a gate, as usual, but by a narrow street, which is the introduction to Caubul. There we were, indeed, astonished by the luxurious appearance of the fruit shops. Melons, grapes, pears, apples, plums, peaches, in wonderful profusion, and all ranged in beautiful order on pieces of masonry, of different heights, so as to exhibit them in the most attractive way.” The shops themselves are little better than sheds. It is not only the beauty of the fruit, but its prodigious abundance, which strikes the mind so forcibly. We do not see half a dozen melons, or a dozen bunches of grapes, but thousands. This display continued a great distance, the shops twin-brothers all, but still delightful. Caubul has always been famous for its fruit. The Emperor Baber says in his Memoirs, “The fruits of the cold districts in Caubul are grapes, pomegranates, apricots, peaches, pears, apples, quinces, jujubes, damsons, almonds, and walnuts, all of which are found in great abundance. I caused the sour cherry-tree, the aloobala, to be brought here and planted; it produced excellent fruit and continues thriving. The fruits it possesses, peculiar to a warm climate, are the orange, citron, the amlook (a berry like the karinda), and sugar-cane, which are brought from Lamghanat, now called Laghman. I caused the sugar-cane to be brought, and planted it here; they bring the julghuzak (the seed of a kind of pine of a large size) from Nijrow; they have numbers of bee-hives, but honey is brought only from the hill-country on the west. The rawāsh of Caubul’ (rhubarb, tarts made of it have precisely the taste of gooseberries) “is of excellent quality; its quinces and damask plums are also excellent, as well as its bâdrengs, a large green fruit, somewhat like a citron.” He also says, that, “on his return from the conquest of Lahore, he brought plantains and planted them, and that they grew and thrived,” but I have not seen one in this country. As we moved along, other articles for sale were presented to view in succession. Cooks were preparing kabobs, and confectioners, sweetmeats. Cutlers and farriers employed on guns, swords, and horse-shoes; the silk mercer, the dealer in carpets, furs, lace, chintz, saddlery, &c., all attentive to their occupations, and all in the open day. The vegetables as well as the fruit are of an excellent kind; and the mutton sold in common to the inhabitants is much superior to any I ever saw in an Indian bazaar. The fat was so white, and the lean was so ruddy.